Recent release “Turning Blue: A Life Beneath the Shield” from Page Publishing author Lawrence Hoffman is both captivating and cultural; this work is a page-turner that keeps the reader intrigued. 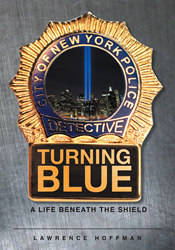 Lawrence Hoffman, a retired New York City Detective, husband, devoted writer and author, has completed his newest work “Turning Blue: A Life Beneath the Shield”: a gripping and potent story of courage, fear, acceptance, perseverance and dignity. Lawrence Hoffman was born and raised on the south shore of Long Island, New York. He joined the New York City Police Department in 1984 and retired with the rank of detective after twenty years of service in 2004. He is a member of the NYPD Honor Legion and has received over twenty-four departmental awards and medals of recognitions along with letters of commendation from the Eastern District of United States Attorney’s Office in Manhattan, the Federal Bureau of Investigation (FBI), and the New York City Fire Department. Lawrence is also a member of the Screen Actors Guild and can be seen in several blockbuster feature films and television shows such as Law and Order, Life on Mars, A Beautiful Mind, The Bounty Hunter, Break the Stage, and The Taking of Pelham 123. Published by New York City-based Page Publishing, Lawrence Hoffman’s passionately crafted biography depicts the personal and professional life of a NYPD detective. Hoffman explains “As a kid growing up on Long Island, I struggled with an unknown psychological need to wear a uniform and a strong desire to be a part of an organization. My search would take me through Little League, Cub Scouts, and various fraternal organizations. This desire would only be fulfilled after joining the NYPD in February of 1984. Readers who wish to experience this profound work can purchase “Turning Blue: A Life Beneath the Shield” at bookstores everywhere, or online at the Apple iTunes store, Amazon, Google Play or Barnes and Noble.